As a Hmong daughter, I was raised in a strict home. Historically, Hmong people lived in the mountain villages throughout Southeast Asia. Today, many have immigrated to the US. The Hmong families living in Southwest Missouri now moved here for farming, and business opportunities, among other reasons. My family and I moved to Barry County in November 2004. Though many Hmong children living in today’s society do not have interest, I am one of the few children who still have love, passion, and respect for the Hmong Culture. Since I moved to Missouri, I continued to volunteer at local gatherings and activities, such as the Miss Hmong Oklahoma 2016-2017 beauty pageant. Hmong beauty pageants are a public entertainment consisting of involved contestants, colorful, traditional clothing, and speeches for individual rounds. Unlike American beauty pageants, contestants do not have the opportunity to have interviews with the judges or committee members of the beauty pageant. Instead, the contestants have to step on stage and give their all to show the judges what abilities they have to deserve the title. In October 2016, I competed in the Miss Hmong Oklahoma beauty pageant and took home the title as first place, Miss Hmong Oklahoma 2016-2017. Hmong pageants take place in mostly all states in the US and even parts of Asia. Competing was a huge decision for me. The competition as a whole took many days of preparation. During my September break at school, I flew out to California where I had my clothing for the pageant personally designed. Though competing in a beauty pageant meant being able to accept the positive and negative comments, I still decided to compete because of my love for my people and goal to help the poor in need. Winning the title was not a simple win. When someone wins the title, they are looked up to and seen as a role model by many. As a Miss or Mr. Hmong, you have many opportunities to be involved in the community and even opportunities to join hands with other title holders to work together on making a difference in the Hmong community. During the beauty pageant in Oklahoma, there were four rounds: introduction round, where each contestant gave a speech about themselves and more; talent round, where each contestant performs their best talent; question round, where each contestant must answer provided questions; and the crowning round, which is the round when the new Miss Hmong is crowned, receiving prize money and a crown. Often after a beauty pageant has taken place, it is optional for the family of the winner to host a victory party, a dinner including entertainment and food, in honor and to celebrate the win of their daughter or son. On Saturday, March 11, family and friends from all over traveled to Granby to join my family and I as we celebrated my win. Besides the food and entertainment, speeches were made by family, friends and myself. As I hold the title as Miss Hmong Oklahoma 2016-2017 until October 2017, I will continue to follow my dreams and goals while also serving the community. Selena Hang is the daughter of Henry and Mary, of Purdy. She is a senior at Purdy High School. 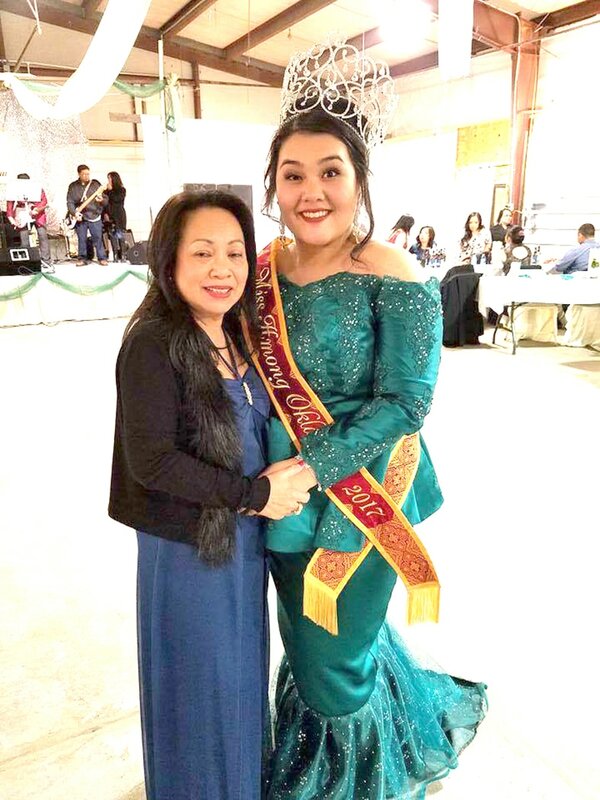 Selena Hang (right), Miss Hmong Oklahoma 2016-2017, is pictured above with last year’s winner, Nancy Maiv Lauj Xiong (left). Hang (right) is pictured above at her victory party with Oy Julian (left).